Burgess Hill FC Women's team recorded their first victory under new head coach Arron Conniff-Broome as they beat AFC Varndeanians Ladies 2-1 at the Withdean Stadium on Sunday afternoon. The Hillians took the lead just before the interval through stiker Shannon McFadden. 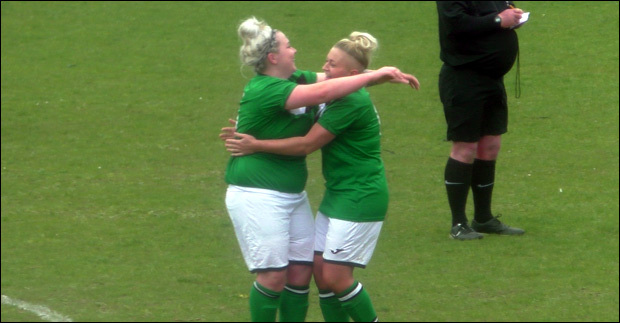 In the 65th minute a long range effort from AFC Varndeanians' Kinlock brought the scores level, but just two minutes later Jess Gray had a 'hold my beer' moment as she eclipsed Kinlock with a deadly strike from distance of her own to put the Hillians back in the lead. The visitors were down to 10 players for the final ten minutes after sustaining a head injury to one of the team, but they held out to record a narrow victory, when in reality the score could and should have been so much more had the Hillians been wearing their shooting boots.